Going into the last race, all six teams had a chance to win the regatta. With four of the teams bunched on the downstream side of the course, struggling to avoid being carried outside the course limits by the current, the Kiwis found a gust and roared off to win the race and the regatta. 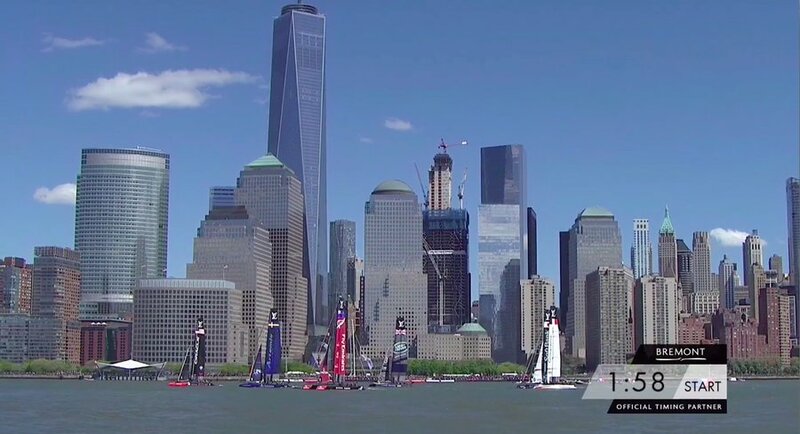 Race 3: Team New Zealand in trouble at start of America’s Cup World Series in New York. Race 3. ETNZ is hooked on the mark and they have picked up a penalty for being OCS (On the Course Side of the line) at the starting signal. Notice, too, that Artemis is off to a poor start, sailing behind the line. On Leg 1 they will be out of position to round Mark1 and be forced to sail back to round it properly. Race 3: Blair Tuke and Guy Endean try to get ETNZ free from the starting mark. Race 3 Leg 4: The current, flowing from top to bottom of the image, has carried Land Rover BAR and SoftBank Team Japan outside the course limit, giving them penalties. Meanwhile you can see the ripples on the water where the gust has launched Team New Zealand into the lead and on their way to winning the race and the regatta. All three lights flashing on BAR. The green light means he is within five boatlengths of the course limit. Ainslie felt Japan did not give him enough room at the course limit. The red light means Ainslie has protested Japan. The blue light means he has a penalty – for going outside the course limits. The umpires ruled that Japan gave him enough room but Japan picked up a penalty of their own when the current took them outside the boundary. Race 3 Finish: Team New Zealand and Oracle have crossed the checkered finish line. Team Japan, Team France and BAR follow. Looking east across the Hudson River to the New York skyline with the One World Trade Center tower. The short race course was set across the Hudson River, with the current flowing from right to left in the image. Enthusiastic fans crowded into the America’s Cup Village and along the riverfront to watch the action. Two giant J Class yachts, J5 Ranger and J8 Topaz dominated the marina. Ben Ainslie and his team showed grit and tenacity to win the Oman stop on the America’s Cup World Series. After getting a third and two firsts in Saturday’s races, they had poor starts in all three double points races on Sunday, including two OCS* penalties. On Sunday they were in last place at the first mark in each race but clawed their way back to finish those races 2-4-3 to win the regatta. *OCS = on course side, meaning they crossed the starting line before the starting signal. The penalty is to drop two boat lengths behind all the boats that started correctly. Watch the video of incidents between Oracle and Team France at the windward gate in Races 4 and 6 in Oman. In each case Oracle lost one place. Since the Sunday races score double points, finishing one place higher either in race would have given Oracle two more points, equal to BAR. Oracle Team USA finished two points behind Land Rover BAR. Did this incident at the windward mark in Race 4 cost them the regatta? If they had come in fourth instead of fifth in Race 4, they would have had equal points to BAR and would have won on the count back. In Race 6 France passed Oracle at the last gate, and Artemis snagged the anchor line on a mark, dropping them to last place in the race and in the regatta. Watch the action in this video. Oracle finished only two points behind Land Rover BAR. If they had finished fourth instead of fifth in the first race on Sunday, or if they had hung on to the lead in the last race, they would have won the regatta. Uncharacteristically last in one race and next to last in another, ETNZ still managed to be on the podium for the event and to maintain their overall lead in the America’s Cup World Series. Winning the first race of each day pushed them into third place in Oman. They maintain a six point lead over Oracle in the series. Three events, three different winners. Land Rover BAR won the opening event on their home waters in Portsmouth. Emirates Team New Zealand took the event in Gothenburg, the only regatta with racing on two days. Artemis Racing took the prize in Bermuda, in spite of a collision with an umpire boat. Notable by their absence in this list is the defender, Oracle Team USA who were on the podium at each regatta but have not managed to win one. ETNZ leads the America’s Cup World Series with Oracle in second. In the table above, the red numbers are the results for Sunday races, which count double. The top line for each team shows their points. The second line is their race results. High point scoring. First place earns 10 points on Saturday, 20 points on Sunday. Last place on Sunday earns 10 points, just like first place on Saturday. Seems odd, but that’s the way it is.